From a sometime contributor to Esquire and Sports Illustrated, a crisp, humane, and very involving briefing on those who tackle disease in the human nervous system. The confessedly religious awe that Noonan brings to the human nervous system ("Ultimately, all research into the workings of the nervous system leads to the soul ")--an awe that informs every page here--stops short of embracing his immediate subject, neurophysicians. And that's just as well, for Noonan explores not only the "miracles" of neurology, but also its sins. Before he ushers us into the hospital-bound world of the neurophysician, however, he offers a concise and unusually accessible tour of neurology, encompassing the brain ("the most complex thing there is") and the rest of the central nervous system, the peripheral and autonomic nervous systems, and humanity's efforts to understand and correct when necessary these systems--from the crude trepanations of cavemen to today's high-tech brain operations. The several years that the author spent witnessing these latter-day operations at N.Y.C. 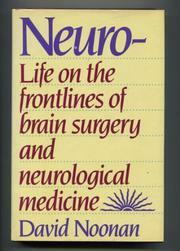 's Neurological Institute bear fruit in the book's second section--an acutely observed account of neurosurgeons and their patients, highlighted by a dramatic telling of the ordeal of a young female writer slammed out of her life and into the hospital for emergency brain surgery. Noonan next examines neurological medicine, covering three areas of disease in chapters of increasing intensity: disease of movement--ALS, or Leu Gehrig's Disease, limned via the tragic case of its name-giver; disease of language--aphasia; and, disease of thought--schizophrenia, which Noonan uses as a springboard for a ringing indictment of the generations of quacks who performed unnecessary lobotomies on thousands. First-class science writing, vivid, plain-spoken, and invested with real moral weight; an excellent complement to Richard M. Restak's related and equally fine The Mind (1988).